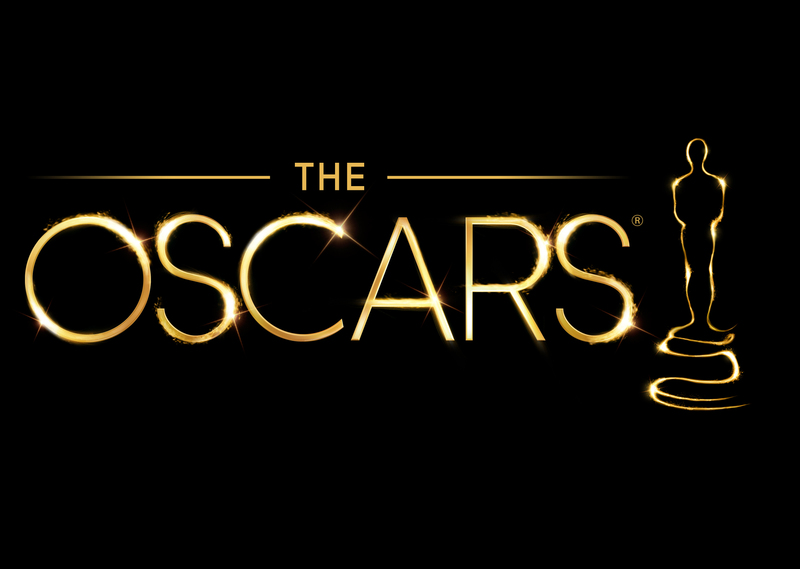 A busy year equated to a late Oscar Predictions list for the year. Additionally, I was challenged with creating a predictions list that was interesting in it’s own right and wasn’t able to come up with anything too revolutionary before the Oscars. Therefore, moving forward, I’m hoping to create an interesting predictions list that is easy-to-read and still uniquely insightful. Stay tuned. Although my two other close favorites, ‘American Hustle’ and ‘Blue Jasmine’ are each fascinating in their own respects, ‘Her’ is my personal favorite out of all the choices here – successfully encapsulating both a sci-fi premise into a romantic comedy. The unique blend created a touching and alarming film that showcases both our love with ourselves and technology. ‘Her’ has been on a fairly good winning streak with only a ‘loss’ at the BAFTAs to ‘American Hustle’ in which ‘Her’ was not nominated at all. The momentum could shift to ‘American Hustle’ however if wins starts to shift in all other categories although that has looked less and less likely in the last few weeks. My favorites here are between ’12 Years a Slave’ and ‘The Wolf of Wall Street’ – the latter being so flagrant in it’s excess that it oddly becomes admirable. However, my choice has to come to ’12 Years a Slave’ which also feels excessive but to highlight the plight Solomon’s plight and the other slaves around him without feeling overly melodramatic or preachy. Few other films this year reached the emotional beats that ’12 Years’ managed to conjure. With only a loss to ‘Philomena’ at the BAFTA’s and ‘Her’ at the Golden Globes (in which both were competing with one another), ’12 Years a Slave’ seems to be a fairly sure fit for the win in the Original Screenplay category. It remains to be seen, however, if this will be one of only a few wins that ’12 Years’ will receive throughout the night. Visual effects have obviously come a long way with this year being no different. However, my personal favorite seems fairly simple with ‘Gravity’ being one of the best looking films of the year. With Cuaron working on the film for years just to get the tech up to snuff, the results show easily on screen with a surprising amount of CG that never seems out of place. ‘Gravity’ is a technical dream that deserves all the praise it gets in this regards. In a category that always seems to leave out some beautiful films, this year – the answer seems pretty agreeable with ‘Gravity’ and has all the momentum from wins at other award ceremonies as well as recognition both critically and financially. ‘Gravity’ may have such an important role for it’s soundtrack without much sound elsewhere other than dialogue; however, I am of the opinion it felt too heavy and overbearing. My vote would go to ‘Her’ which has a subtle and soothing soundtrack that complements the film well. Much respect has to also go out to the Arcade Fire collaboration which worked for the film rather than to it’s detriment. ‘Gravity’ has most of the wins here from past contests and with a lot of momentum for the film in most of it’s categories, the Academy seems sure to vote for it again here as well. The only other winner, ‘All is Lost’, at the Golden Globes is not even nominated here. The fairly surefire answer, personally, is ‘Gravity’ for the Oscar Editing Award. Space has rarely seemed so dark, isolating and fascinating and although the editing is only one cog in a complicated frame, it was such an integral part in making scenes tense at one moment and lonely in the next – it’s a terrific accomplishment. ‘Gravity’ has lost to ‘Rush’ at the BAFTA’s but with ‘Rush’ not nominated here, ‘Gravity’ (again) has the momentum going for it as a critical favorite and a win at the Critic’s Choice Awards. ‘Gravity’ once again seems like a clear victor here on a personal front. With Cuaron’s signature long take style and the film having a myriad of crazy shots all over, the cinematography is absolutely top-notch as always. The first fifteen minutes of the film, which includes perhaps the most quiet moments throughout, is an absolute treat for any film lover looking for great camerawork. With a near sweep at the major awards, ‘Gravity’ once again looks to take the award easily here. Unfortunately, I have yet to watch the Wind Rises which (from word of mouth) is a very strong film. Therefore, I’d rather leave this blank. Although critically, there has been talk of the respect for ‘The Wind Rises’ as Miyazaki’s ‘final’ film, ‘Frozen’ has swept the critical awards and looks to take the award fairly easily. Disney has had an absolute critical and financial hit with ‘Frozen’ and with its unique stake in Disney history, it looks to land the Oscar as well. There are some absolutely fantastic performances here – some of my other favorites being Roberts, Nyong’o and Squibb (and Roberts having nearly a role that could have stood in the main actress category). However, my personal favorite has to go to Lawrence who brought out such a fun and wacky role in ‘American Hustle’ and is one of the most memorable from the film as a whole. A shame that she was not in the movie even more, but when she was on screen, it was hard to not pay attention. Here is one of the more hotly contested awards of the night with Nyong’o and Lawrence both landing nearly equal awards throughout the season. Nyong’o does have the slight edge some more recent wins such as at the Critic’s Choice Award, although as some critics have mentioned, ’12 Years’ may have some problems with many in the voting body possibly thinking of the movie as too heavy while ‘American Hustle’ has gotten a lot of early love from critics which may translate to rewarding the film here. The actors category continue to have such a strong amount of great competitors this year with the supporting roles. Although Hill and Cooper may land in my favorites (while Abdi, like Roberts, having a role that could have stood as a main actor role), Leto has the most fascinating character as a transgender woman suffering from AIDs. Much like his co-star, McConaughey, the role goes far beyond just the physical transformation but also the lighthearted and heartfelt emotions that runs through the role. Cheers to Leto for such a terrific performance. Although Leto lost to Abdi at the BAFTA’s, Leto has won all other critical awards and is looking to go into the Oscar’s with the most momentum here. There is also a lot of love for the ‘Dallas Buyers Club’ project and the knowledge about it’s long campaign to become a film may reward the film with acting wins. Another strong group of actors here – some of my personal favorites come from Dench (who technically did feel like a supporting role), Adams and Blanchett. However, the best overall performance has to be Blanchett – a depressing character in a film that just continues to grow depressing with each act. Blanchett plays Jasmine with such conviction in her lies and insanity that the character almost grows to be pitiful until the final few acts – one of Blanchett’s best roles to date. Cate Blanchett has pretty much won most of the awards coming into the Oscars here with only Adams and Bullock winning one or two awards in separate categories. However, the voting body seems to want to reward ‘Blue Jasmine’, if not in the screenplay category, they will most likely do so here. This category was tough to narrow down to one. 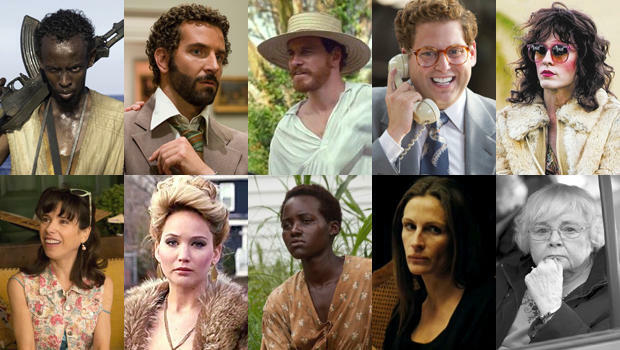 My favorite roles here probably could be narrowed down to Ejiofor, McConaughey and DiCaprio. However, DiCaprio wins out for my personal favorite. Even though the role and film itself could be hated as excessive and gluttonous, DiCaprio simply shines as the villainous Belfort and pushes himself to encapsulate a man who simply love his wealth and himself all too much. I argue that it’s one DiCaprio’s best characters with such conviction in his delivery and emotions. Here comes another interesting contentious category. Ejiofor and McConaughey are the favorites here (with DiCaprio only winning a few awards – mostly in separate categories). McCounaughey has the slight edge over Ejiofor, however, both in awards count and, once again, the heavy-hearted talk about ’12 Years’ in general may work against Ejiofor. I personally have a lot of love for McQueen, O. Russell and Scorsese – all for unique reasons and for terrific films. If these were the only directors in the race, Scorsese would have probably gotten my vote. However, Cuaron, in the end, feels like he most deserves the award here. ‘Gravity’ really is the lovechild of Cuaron from start to finish – from it’s pre-production to the editing room. Characteristics of Cuaron are also highly present throughout the film such as long shots, tough/tense shots and themes of humanity. ‘Gravity’ is a labor of love and Cuaron is the heart. Fascinatingly, even though ‘Gravity’ most likely will not win the Best Picture Award, Cuaron has swept every award for Best Director. Much like my comments above, the long-in-development narrative behind ‘Gravity’ and the final product have proven to be critically viable and will most likely garner a win. Only McQueen has a small chance to upset here if the voting body feels like ’12 Years’ is getting neglected. 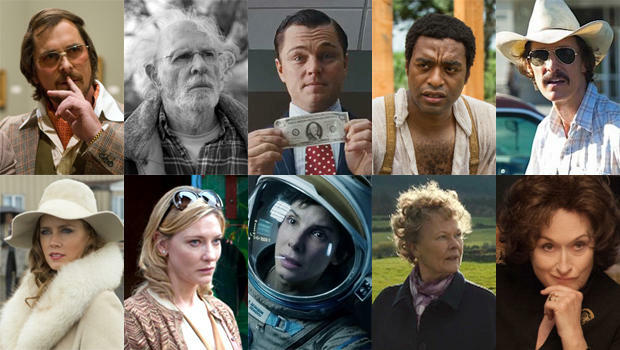 Much like my top 10 film list for 2013, ’12 Years a Slave’ also tops the list here as well. A powerful film that is unrelenting in it’s punishment and visceral in it’s vision, ’12 Years’ may be hard to watch but is such a solid film overall and is thematically important for it’s time. The final award of the night looks like it will most likely go to ’12 Years a Slave’ as it grabbed most of the past critical awards. 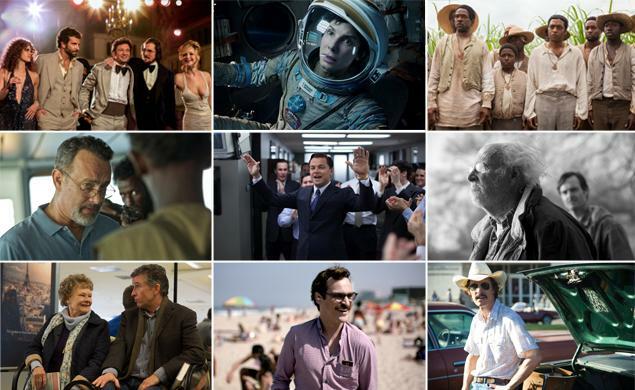 ‘American Hustle’ and ‘Gravity’ may have the best chances to upset with either past wins in separate categories or just love for the film overall. However, the bigger story will be if the Academy voting body (much like at the aforementioned award shows) mostly ignores ’12 Years’ except for a few awards like the ‘Best Picture’ category.